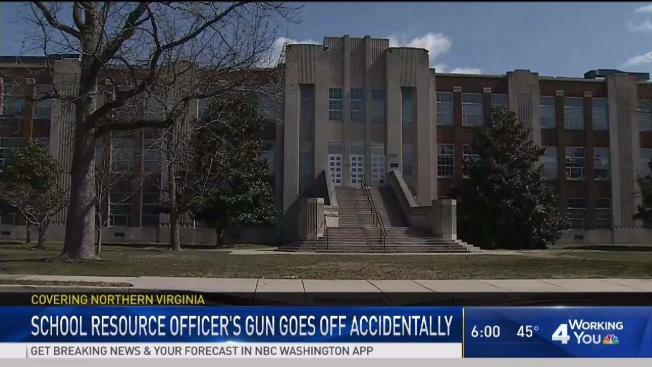 A school resource officer accidentally fired his gun inside a middle school in Alexandria, Virginia, during school hours on Tuesday, police say. No one was hurt. The officer was inside his office at George Washington Middle School in the Del Ray neighborhood when he accidentally discharged his service weapon about 9:10 a.m., according to Alexandria police. The shot was fired as the officer, a five-year veteran of the Alexandria Police Department, was sitting down in his office, police said. A department representative declined to say whether the officer had taken his gun out of his holster. "I just think it was an accident that happened, and we're going to investigate it and find out, and we're going to move forward," Capt. D.C. Hayes said. The officer checked the area for any potential injuries and found that everyone in the 1,500-student school was OK. He notified his supervisor and school staff, and classes continued as normal, police said. It wasn't immediately clear if any students or teachers were nearby. The incident occured amid a highly charged national conversation about arming teachers. The head of the school system said she doesn't think arming teachers is appropriate. "We had this happen with someone who's a highly trained officer. I think that speaks for itself," interim superintendent Lois Berlin said. Several parents who spoke with News4 agreed. "I'm happy he wasn't injured and nobody else was injured, but I think it's a great reason to say we don't need more guns in schools," one parent said. "We're talking about arming teachers, and even the security personnel that are trained can't seem to make it work," another parent said. Also on Tuesday, a teacher who serves as a reserve police officer accidentally fired a gun in a California classroom as he taught a class about gun safety. A 17-year-old boy was injured by bullet fragments, his father said. Police are updating the incident in Virginia. The officer has been placed on routine administrative leave.